I grew up in rural Vermont with parents who had very strong views on food. Actually, they had pretty strong views on most topics, but since we’re talking cooking today we’ll stick with food. In general we followed a very strict diet which slowly loosen up over the years. When I was in elementary school there was no meat or fish of any kind, limited dairy products, and no sugar. In my high school years chicken and fish started showing up on the dinner table, along with most dairy products, but sugar and red meat were still considered evil. On my first day of college I gleefully abandoned all restrictions and subsisted for the next four years on a diet which would probably make most parents cringe. But I am happy to say that post college I slowly reverted back to a more nutritious lifestyle, though still one without any restrictions. At this point even my parents have further loosened up and today will eat most everything in moderation. By the way, I should mention that this entire time I also had another set of parents in Chicago who had a more mainstream diet and who I visited a few times each year to get my fill of chocolate chip cookies and other forbidden delights. My step mother claims to this day that the reason we have such a good relationship is because she introduced me to chocolate, and I’m not going to deny that it may have played a role:-) But since I only spent a small percentage of my time in Chicago, there were many foods which I simply did not encounter until I was older, and a few which I have still yet to try. Why do I bring this up? Well, there seem to be a few recipes which most of the French Fridays with Dorie crew instantly associate with a loved (or sometimes hated) childhood dish. 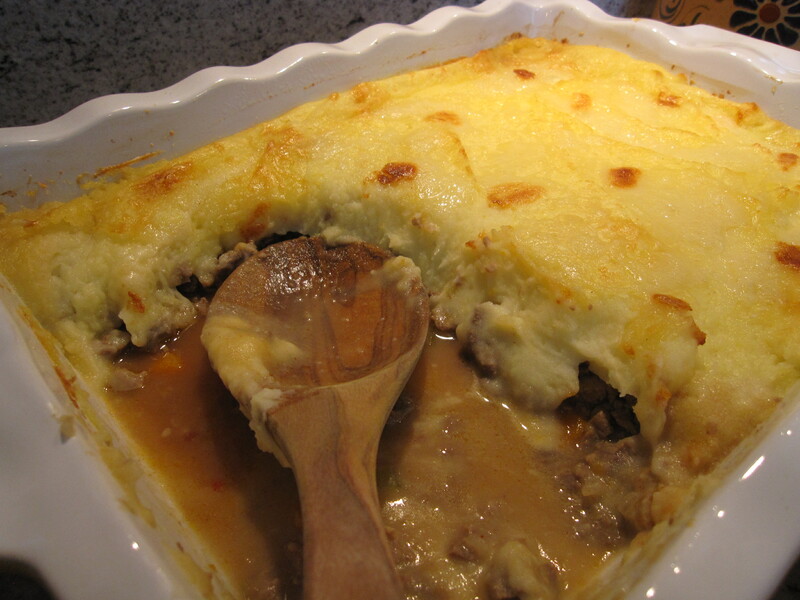 In particular, Dorie’s recipe for Hachis Parmentier (a previously completed FFwD recipe which can be found here on NPR) was branded a “french version of Shepherd’s Pie” by many of my fellow home cooks, some of whom had fond and some not so fond memories of their mothers’ version. Having never encountered Shepherd’s Pie myself, I went into Dorie’s recipe with no preconceived notions or expectations, except that it seemed to be a pretty heavy casserole of some sort and looked like an awful lot of work to get on the table. Hachis Parmentier is indeed a bit of work, that is unless you happen to have leftover boiled meat hanging around, which according to Dorie is how the recipe is traditionally made. If you don’t have any handy leftovers, this is in fact two separate recipes, first a beef stew and then mashed potatoes, layered together in a casserole dish and then thrown in the oven for half an hour. Well, it was fantastic and we will definitely be making it again. I know that it may not look like much in the photos (not one of Dorie’s more photogenic recipes) but it is delicious and definitely worth the effort. My husband, who was also a little dubious at first, really enjoyed it as well. 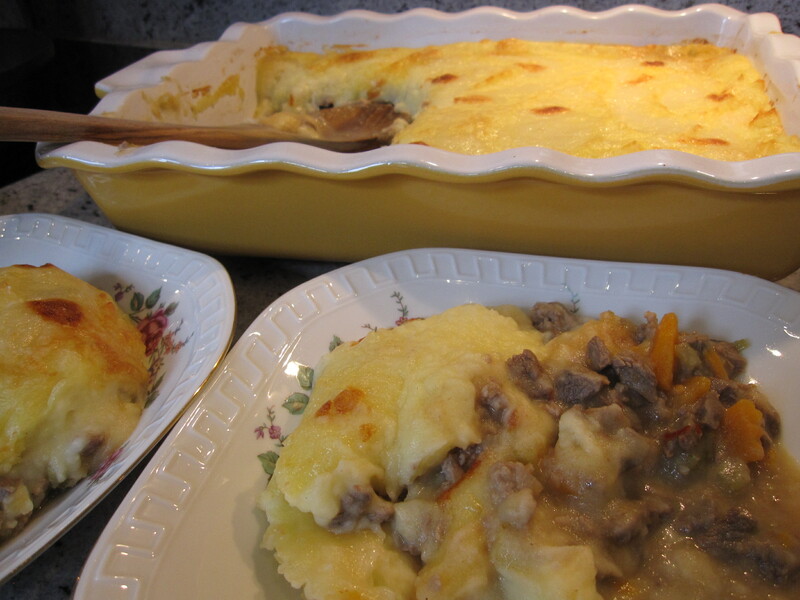 Two thumbs way up for french Shepherd’s Pie! I loved this dish as well. Reading your post has made me want to make this dish again! I had shepards pie at Serendipity in NYC and it wasn’t the most amazing dish, made with ground beef in A LOT of oil…. I think the chef had a bad day that particular day. This one is on the list of catch-up dishes to make when my husband comes home. Like you, I don’t have any childhood memories of having my mother make this dish – I think my mother would have been baffled by the idea actually!